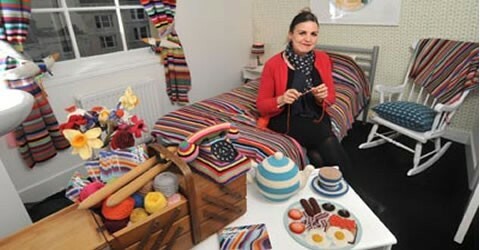 If you ever find yourself in Brighton, UK, and you're missing your home with its massive yarn stash all around you, you might think about checking in to the Hotel Pelirocco. To call this place "funky" is an understatement. Each room has a theme and the newest one is a single room called the "Do Not Disturb Room". I don't know how often the room gets rented out but the owner could probably charge admission just to view it and could make a profit! I learned about this place from the Wool-Tyme (Kingston, Ontario) newsletter. You can see more pictures and read more about it in British newspapers, click here or here.